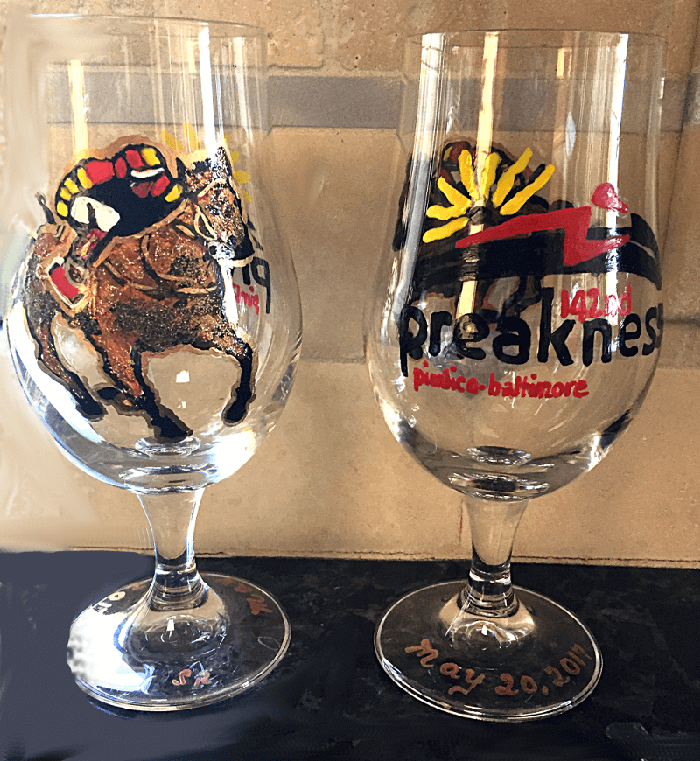 Clearly Susan was honored the year of 2017 to be asked by a client to hand paint glasses for the 2017 Preakness, the142nd Preakness Stakes Horse Racing Event held at Pimlico Race Course. As part of the Triple Crown, we wanted to especially create for the Preakness an original design on Preakness Stakes Glasses,to be treasured for years to come. 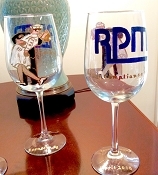 Our Preakness horses hand painted on Preakness Stakes glasses show the horse in full throttle with legs galloping away to reach the finish line. For finishing touches for our Preakness horses we add just a touch of glitter to make the color pop and then outline in a thin line of gold. Makes you want to go to the races and wear your hat! If you have an event that want to attend and would like a glass hand painted to commemerate an event then email me at support@clearlysusan.com, and we would love to create something special for you. Now the one thing that is in these Preakness Stake glasses is the black eyed Susan drink, a preakness drink that will delight anyone's taste buds. There are many variations to the black eyed Susan drink, but here is one that we prefer. Of course, we like the name, too. "Historic Pimlico Race Course, home of the Preakness Stakes and second oldest racetrack in the nation behind Saratoga, opened its doors on October 25, 1870. Pimlico has hosted many racing icons for over a century; legendary horses such as Man o’ War, Sir Barton, Seabiscuit, War Admiral, Citation, Secretariat and Cigar have thundered down her stretch in thrilling and memorable competition." "In the United States, the Triple Crown of Thoroughbred Racing, commonly known as the Triple Crown, is a title awarded to a three-year-old Thoroughbred horse who wins the Kentucky Derby, Preakness Stakes, and Belmont Stakes. The three races were inaugurated in different years, the last being the Kentucky Derby in 1875. These races are now run annually in May and early June of each year. The Triple Crown Trophy, commissioned in 1950 but awarded to all previous winners as well as those after 1950, is awarded to a Triple Crown winner."